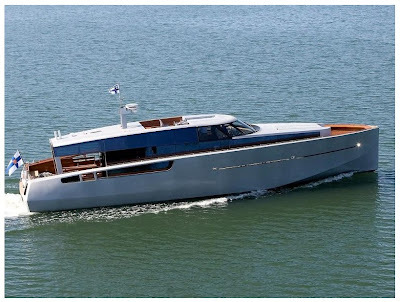 It is in today's Finnish news that the President of Finland took possession of the New Presidential yacht. My first impression is that the yacht is about as ugly as they come. Really, this thing looks hideous. These photos were found at the Finnish Talous Sanomat story here. Tarja Halonen, the Finnish president, on Monday took delivery of Kultaranta VIII, the new presidential yacht, at a shipyard in Uusikaupunki. 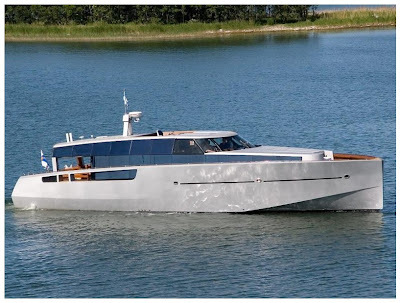 The 19-metre aluminium-hulled vessel has wood fittings and large windows. Like previous presidential yachts, she is to be operated by the Finnish Navy. The cost of the yacht is about two million euros. Kultaranta VII was decommissioned after 22 years of service. Just because the yacht is operated by the Finnish Navy, doesn't mean that it has to be painted Gray. You can find more pictures posted on the Aamulehti site here. Add power to money as things that when held in quantity don't help improve taste. Seems that we don't have a lock on wasteful government spending either. I like the look. It´s like a mix of 1950 wood boat and a 2008 Volvo car (back). White colour would been better. The name is "Kultaranta VIII" as it's the tender used to ferry people from Kultaranta, the name of the President's summer villa. No drama there. "Which one do you plan on sinking first?" Jet Lag for Toddlers 101: Midnight = 5P.M.